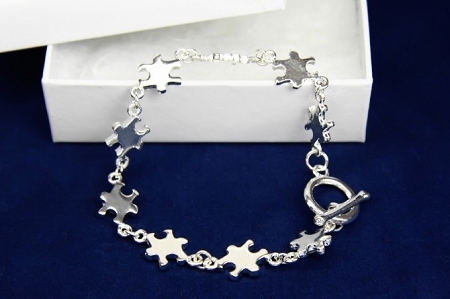 Sterling silver plated autism awareness bracelet. 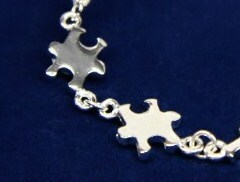 Silver puzzle piece charms interlock to form the bracelet. 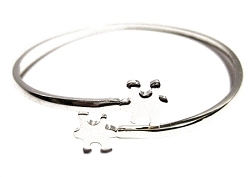 The puzzle pieces reflect the mystery and complexity of the autism spectrum. Silver toggle closure. Bracelet is approximately 8 inches. The puzzle pieces are approximately 1/2 inch by 1/2 inch each. Thanks so much!!! Super fast shipping!! LOVE THIS BRACELET!! Beautiful bracelet, great communication, super-fast shipping, A+++++ seller !! The item is exactly as advertised. I love it. Thank you very much. It's a beautiful bracelet, very dainty and feminine. The only problem that I've had with it is it's fallen off a couple of times. The attaching loop needs to be a fraction smaller so the toggle doesn't slip through.